Pen Velo found both individual and team success during the Red Kite Omnium Championship Weekend in both the Red Kite Omnium Finale (Sept. 5) and the NCNCA Masters District Criterium Championship (Sept 6). The Red Kite Criterium on September 5 was the final event of the Red Kite Omnium, a series of road, time trial and criterium races that started in February and continued all season long with both individual and team competitions. There were some exciting individual performances for PV in the RKO Finale. The day was highlighted by Bill Brissman (assisted by a strong team) taking two 10-point primes and finishing in 5th place in the M55+ 3/4 race and protecting his narrow lead in the overall omnium in that category. Alex Jonas suffered a last-lap crash that cost him 2nd place in the E4 omnium. Despite having to walk his bike across the line after the field in the finale, Alex still finished 4th in the omnium. Thanks to contributions from many teammates over the course of the season, Pen Velo swept the master 3/4 team prizes as well as taking the best team prize in the 55+ 1/2/3 category. 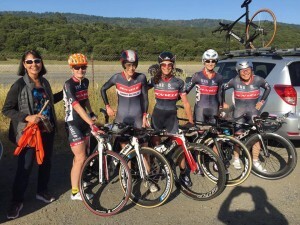 Day 2 was the NCNCA Masters District Criterium Championship, and it was a day for the PV Women’s team to shine. The PV women were represented by Sara Stearns, Heidi Fraser and 3-time district crit champ Norma Hilton. All three competed together, but in different age groups in the combined women’s 50+ race. All three put in strong performances, with Heidi animating the race with repeated attacks, Norma and Sara claiming Bear Jerseys in their respective categories, and Sara claiming a prime. Teammates: Andrew Horvai, Ken Salvail, Jose Ortiz, Mark Koenig, Rene Larro, Michael Tauber, Paul Burt, Glenn Fetsch, Terry Langeman, Alan Brake, Steve d’Alencon, and Lanier Benkard. I’m going with a long race report. No, it’s not my birthday, but maybe when I’m blowing out the candles 25 years from now, I’ll read this again and remember the great times with Pen Velo at the 2015 Chico Stage Race. First, some context ‘cause I’m new to the road team: I’ve never been an athlete. At best, I was a second rate football player in high school, and an even worse Gaelic football and rugby player when I tried those sports for a season or two afterward. But I never liked any sport enough to really work at it. And that was it for 20 years. Then I started racing cyclocross two years ago. The main competition in cycling is inside ourselves. Sure, many of us love racing, but most of our relative time on the bike is training, or even doing a ride with friends that has its challenging points. The main competition is always within, whether training or racing: How far can I push myself? Can I go outside my comfort zone a bit today? Can I do my job to get a teammate where he needs to be? Will I be able to not push myself when that’s called for? Can I go faster now? Can I be patient and not strike too hard to too soon? How long can I hold this? Can I pass this guy and finish just one spot higher at 72nd instead of 73rd (true story for me)? Should I go now? Will I really do [fill in the training you hate most] today? These are the daily victories (and sometimes defeats) that keep me going, and why I like training and racing. But the reason I love it now is being able to fight with a team. My team experience with PV CX last year led me to want to try road racing with you. And it is awesome fun. Some days good luck cascades down like Pegasus flying overhead and sprinkling magic fairy dust into your Sapim spokes, coating you in invincibility against all odds. Other days bad luck scrabbles at you from the pavement (or, in this case, gravel), where the smallest rift in the workings of our Fine Machines effectively ends our competitive run that day. Most days we see neither. But we must be prepared – mentally, mechanically, and physically, for anything, both as athletes and as a team. My race report does have bad luck – a flat in the gravel that ended my run as a GC contender. But the good luck? Having a coach and teammates that helped me then win the Crit and the TT. I was nervous as all get out as this was my first race with the team. I am in decent shape from CX season, and the gravel appealed to the crosser in me. Still – did I mention I was nervous? I don’t get many hall passes, either, so this was an A race for the team and me too, personally. Maybe the biggest race of the year for me, as I thought I might have the mix of skills, and the early-season fitness advantage, to do well. And I was nervous. But I had a coach and teammates who kept me on an even keel. We executed exactly according to the plan fomented with Clark, and attacked in the gravel, with Rene setting the pace at a level that immediately caused a split. Rene was up front, followed by a covering Cushman rider, with me third in line. We were killing it and I was feeling great on the gravel (thanks, CX). Then the race “organizers” let us catch the 55+ field, but had not neutralized them. So Rene had to yell “COMING THROUGH ON YOUR LEFT!! !” Chaos ensued. Some guys in the field apparently thought an attack was coming up, and Rene said they moved over to block (!) and gave him some choice words!! Rene was then yelling “45s coming through!” and we were left with maybe 3 feet of the poorest part of the gravel at the edge to ride on, moving fast. Then my rear tire sidewall got cut – 25c with an anti-puncture strip, but not all the way up the sidewall (does even the Paris-Roubaix open tubular have this? ), which is where my tire got cut. By the time I got a neutral wheel and went, it was minutes later, I was waaaay in last place, and I never saw either the lead group or the chase group again. I was left doing a time trial, picking off riders here and there, for the next 15 miles. Finally caught on with another strong rider from Body Concepts at about mile 20 or 25 who had had a mechanical, and he gave me some direction to work together efficiently. Thank gosh. I was disappointed when the groups we caught each dashed my hopes, as they kept being 55+ riders, instead of 45+ as I hoped. (I didn’t know that both 45+ groups were moving at a good pace, in part because of Rene’s attack on the lead group that allowed Phil and Lanier sit in.) The two of us caught up to the 55+ peloton and yo-yoed with them a bit before we were able to pull away. I asked Erik Salander if I was allowed to be in their pack (oh, what glorious rest that would mean!) and he told me that it would be a DQed though I was welcome to latch on and have them tow me home. I’m glad he was there to tell me that. Never quit! The Body Concepts guy and I caught Terry with one other guy at about 5 mi or so to go. All was great working with four guys until Mr. Body Concepts decided to attack the group with about 2 miles to go! I don’t know where I found the strength to cover it, but I did – I was a little mad because there was no point to it. Maybe he was thinking Terry and I would conspire, or that we were all too slow and would be caught by the 55 field (not anywhere in sight), or could still catch a 45+ field (again, nowhere in sight)? So, the two of us rode away. With somewhere around 400m to go, I asked him if he wanted me to let him cross first as thanks for the instruction he gave me in working together, or wanted to sprint for the finish. He gave me a look and just smiled. And so we sprinted, and I found something in myself to earn another of the many slices of inner victories for myself that day, which, as always, was as filling for 26th place as it would have been for 6th. Despite my efforts, I personally was far out of top 10 GC competition at -5’32”. But five of us had a great dinner that night at the Sierra Nevada Brewery, PV was solidly in the GC contention, and my spirits were high — those of you who did not make it, you were missed! So we shared our table with two pros, including the Swedish National Champion, and that was interesting as well. Our plan was to have Lanier (our best GC shot sitting at 4th) follow the wheels of our strongest guys near the front, while sending up guys now and then to keep the pace up and the pack of 59 or so strung out and safe. We memorized the numbers of the three guys ahead of Lanier, and they were marked men. The plan worked nearly flawlessly. However, other teams have their plans too. When we lined up at the line, we had four or five PV guys right up front. The sun was just cresting over the downtown buildings with that golden glow of a fine morning, casting its light directly across the front rank. Looking down the smart line of PV racers ready to go – hell, we were finer than the Roman Legion. Our team was cheering us on in the first corner. It all felt great. I saw a whole mess of PV guys moving the pace through the race, including guys pushing off the front to keep it going. It was incredible! Guys I’d raced CX with, like Mark, Rene, Andrew, Terry, and Ken, and new guys for me like Phil, Mike, Glenn, Alan, Steve, and Jose. All working hard. Lanier was, as planned, trying to stay on a PV wheel in the front third. I kept in the top 6 or so for most of the race, so I could keep tabs on the top three riders, who were making regular appearances in our group along with other GC contenders. I decided to attack in a few places to stay in the front group, do my part to try to keep the pace up, and pick off about a third of the lap premes, mostly Sierra Nevada beer. I did think it was important to cross the line first on the first lap. Hello, Pen Velo is here! Things were going fine until the top two guys in the GC – Audi and SJBC – brought what I think was a coordinated, preplanned attack on the second to last lap to try to get time on other GC contenders. I wouldn’t be surprised if they had teammates doing a bit of blocking for them near the front when it happened. I hit it, and was able to cover the attack, but I was alone with them. They set a blistering pace through the 1/2 lap into the start/finish with one lap to go. One of them turned to me then and said “let’s work together and win this thing!” I didn’t say a word. I was going to be the boatanchor on this break because Lanier was back in the main group. Worst case, neither of these guys was getting the 10 second bonus if I could help it. These two guys were strong. Plus, as three riders we easily got through the carnage (thank gosh Rene didn’t get seriously hurt) on our last lap (after the first turn), while the pack probably had to slow more in that corner. It was all just enough to make it the winning break. We were in the last straight and the SJBC and Audi racer both slowed up a bit to set up for the sprint. I was going to wait a bit longer to follow or go when suddenly – there was Phil next to me! “Go now, Nate!” He was like an apparition. Blood was leaking through his jersey. The look on his face was that of the hardest of hardmen. He had just used everything he had to bridge up Lanier to the breakaway, with the peloton really close behind trying to close the small gap. “Go now! Before the turn!” I don’t know where he found the energy to bridge up Lanier with his injuries from the road race. Or found the breath, or mental wherewithal, to give me that directive. But I wasn’t going to make him ask three times. I hit it, gapped the Audi and SJBC guy in the turn, and they could not respond either in time or strong enough – the moment had been perfect, and it wasn’t even close. I even got to do the “look back,” ha ha! Phil had called it dead on. 5 seconds, over 24 minutes. How did I get those 5 seconds? -Teammates picking up the BtC TT sponsorship and then volunteers running it like clockwork, so that I had a chance to do one real TT before Chico? Easily worth 25 seconds. -A Teammate taking his Saturday morning to teach a well-thought and encouraging TT class for PV newbies like I? Undoubtedly 50 seconds plus. 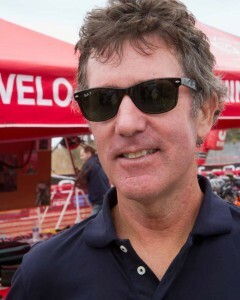 -Teammates working hard to get us the killer deal on Trek bikes from Summit, that enticed me to buy a TT bike? Certainly another 30. -Teammates providing advice on everything from tire pressure to bike position? Each piece, absolutely 5 seconds. -The two Teammates who encouraged me to try aero wheels, leading me to buy a used set? Yes, my wife hates you both now, but positively 45+ seconds in that gusty wind in Chico. And Teammates encouraging me to fight on and drill it even after my road race disappointment? You know who you are. You earned this. While the RR left me out of contention and some other mishaps left Pen Velo out of yellow, Rene and Phil both finished in the Top 10 despite each suffering crashes (NEVER QUIT!!!!). But perhaps the Audi/Reno-Tahoe GC winner – who took second to us in both the RR and the Time Trial — might feel like that yellow jersey doesn’t quite fit him as well as it might, and in some moments has a red and black tinge to it. Thanks guys and gals. It is, and is going to continue to be, a great season for us. PV Cyclocross Squad Heads to CX Natz! 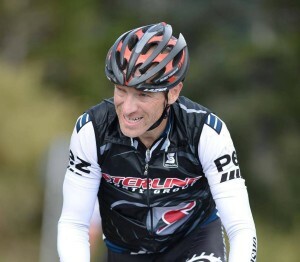 Posted in racing | Comments Off on PV Cyclocross Squad Heads to CX Natz! PV has arrived at CX Nationals! 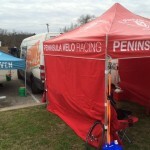 Five PV CXers made the trip with Coach Clark Natwick to the USAC Cyclocross National Championships in Austin, TX. District champ Murray Swanson, Steve Hindman, Rene Larro and Chris Cowart will compete in the master men’s races on Friday, Jan. 9 and Madelyn Swanson will race with the junior women on Sunday, Jan 11. Thanks to our sponsors Summit Bicycles, Pearl Izumi, Shimano, and Challenge Tires for support at this event.